Individuals with multiple chronic diseases are often prescribed medications for each condition and thus must manage a drug regimen. Medication self-management is challenging for most individuals with chronic diseases, but it can be especially difficult for African American older women. 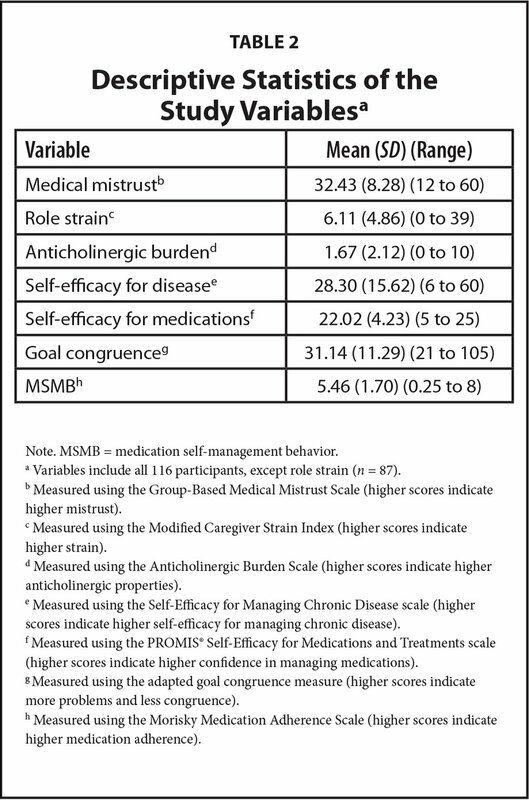 This study investigated how medical mistrust, caregiver role strain, and other relevant variables may be associated with medication self-management behaviors (MSMB) among African American older women, and whether goal congruence and self-efficacy mediated the relationship between the predictor variables and MSMB. A sample of 116 African American older (age >50 years) women from central Milwaukee participated in this correlational, cross-sectional study. Although goal congruence and self-efficacy were not found to act as mediators, the main finding was that goal congruence, self-efficacy, and age predicted 30% of the variance in MSMB. The results suggest that it is essential to strengthen individual self-efficacy, determine the goals that individuals have for their medication regimen, and develop support mechanisms to help patients attain these goals to better manage chronic disease. African American individuals in the United States continue to have significant health disparities in chronic disease outcomes (Institute of Medicine [IOM], 2012; Population Health Institute, 2016). Individuals with multiple chronic diseases are prescribed medications for each condition and must manage a drug regimen. Challenges to medication self-management behaviors (MSMB) may contribute to disparities, particularly when individuals are expected to manage multiple chronic illnesses with numerous medications (Aitken, 2013). Medication self-management is challenging for all individuals with chronic disease but can be especially difficult for African American older women because they have higher rates of chronic diseases (e.g., diabetes, hypertension, heart disease) that occur at younger ages than in White women (IOM, 2012). More diseases equate to more medication and often more complex medication regimens. A more complex regimen equates to higher cost, medications that need to be taken at various times, more side effects, and drug interactions. African American women have other life challenges that can have an influence on MSMB, such as poverty and extensive caretaking responsibilities. In 2016, the national poverty rate for women was 11.9%. In Wisconsin, White women reported a 9.8% poverty rate, whereas Black women reported 30.1% (U.S. Census Bureau, n.d.). Time demands for African American women are also higher due to more family caregiving, thereby decreasing the time available for managing one's health (McCann et al., 2000). Therefore, improving the MSMB of African American women may help decrease the health disparities gap in health outcomes among this population. Medication self-management encompasses a broad array of behaviors in which individuals engage when they have a regimen of prescribed drugs for their chronic diseases. Medication adherence, as a component of MSMB, is defined by the World Health Organization (WHO; 2003) as “the extent to which a person's behavior (regarding) taking medication corresponds with agreed recommendations from a health care provider” (p. 17). However, MSMB include other behaviors, such as monitoring for effectiveness and side effects and communicating with providers. Although there is a large body of literature on medication adherence, there is less clarity on medication self-management (Bartlett Ellis & Welch, 2016). There are many reasons for the actions individuals take related to their medication regimen and the science of understanding these self-management behaviors is still emerging, particularly for different groups of individuals, including African Americans. Prior research has focused more on the concept of adherence than on the broader concept of MSMB (Bartlett Ellis & Welch, 2016; Hiligsmann, Bours, & Boonen, 2015). From the MSMB perspective, individuals reported behaviors such as encounters with providers and pharmacists and the daily management of drugs (Bartlett-Ellis & Welch, 2016; Gallant, Spitze, & Prohaska, 2007). Understanding the unique factors associated with MSMB in African American older women with multiple chronic diseases is essential to developing individualized support interventions for individuals with chronic health conditions and thus improving their health outcomes. There is considerable evidence that optimized adherence to medication regimens prevents disease progression, reduces complications, lowers mortality, increases quality of life, and reduces health care costs (Luga & McGuire, 2014; Shah & Haiijar, 2012; Stuart, Simoni-Wastila, Zhao, Lloyd, & Doshi, 2009). Poor adherence, on the other hand, has been shown to accelerate disease progression and potentially lead to death (Berry et al., 2010; Gellad, Grenard, & Marcum, 2011; Marcum et al., 2013; National Center for Health Statistics [NCHS], 2014). Medication adherence is a component of MSMB, and poor MSMB is also costly: avoidable health care costs associated with poor MSMB can reach between $100 billion and $290 billion annually (NCHS, 2014). The current study used the Individual and Family Self-Management Theory (IFSMT) (Ryan & Sawin, 2009) (Figure 1) as the framework. The IFSMT identifies a process of chronic disease self-management that occurs in a specific context of risk and protective factors related to the condition or conditions located in distinct physical and social environments. Individuals use self-regulation skills, knowledge, health beliefs, and social resources to achieve positive health-related outcomes. Proximal outcomes are MSMB and health care utilization. Distal outcomes could include health status, quality of life, and health care costs. Model of Individual and Family Self-Management Theory applied to medication self-management in African American older women. Adapted with permission from Ryan and Sawin (2009). The study postulation was that medical mistrust, care-giver role strain, and the composition of the medication regimen are risk and protective factors that could adversely impact MSMB in African American older women. Medical mistrust is defined as a lack of trust in a health care system felt by those who have experienced discrimination when receiving care (LaVeist, Nickerson, & Bowie, 2000). Racism and discrimination continue to weigh on African American individuals in the United States and can have harmful effects on their health (Trachtenberg, Dugan, & Hall, 2005; Wagner et al., 2011). Negative experiences combined with continuing adverse socioeconomic conditions have created higher levels of mistrust of health care providers among African American individuals (LaVeist et al., 2000). Higher levels of mistrust have been found to lead to adverse health outcomes and an increase in making one's own decisions (different than the provider's recommendations) about one's care, including those specific to a medication regimen (Cuevas, 2013; LaVeist et al., 2000; Thompson, Vladimarsdottir, Winkel, Jandorf, & Redd, 2004). Caregiver role strain describes the impact of caring on the caregiver. Role strain can occur whenever family caregivers find it difficult to perform specific caregiving responsibilities or feel stressed by the responsibilities associated with serving multiple roles (e.g., parent, daughter, caregiver, employee, church member) (Wallace Williams, Dilworth-Anderson, & Goodwin, 2003). In addition, the time spent on providing care for others decreases the time available to care for oneself, including performing health self-management behaviors. These stresses are particularly prevalent among African American women, who report 30% more family caregiving duties than White women (McCann et al., 2000; Schulz & Sherwood, 2008). For older women of all ethnicities, the characteristics of medication regimens have a potential impact on MSMB. The medication regimen for older adults often has a narrow therapeutic window for drug tolerance, which makes drug characteristics critical (Campbell, Maidment, Fox, Khan, & Boustani, 2013; Chew et al., 2008; Pasina et al., 2013). Medications with a high anticholinergic burden, which is the cumulative effect of using multiple drugs with anticholinergic properties concomitantly, can impact MSMB by leading to an inability to reason clearly and an increase in adverse events such as dizziness and falls. Taking many prescribed drugs complicates medication self-management and increases the likelihood of adverse drug interactions (Ruxton, Woodman, & Mangoni, 2015). Consistent with the IFSMT, the process of self-management includes goal congruence and self-efficacy. Goal congruence describes the degree to which the goals of the individual can be met—for this study, relative to MSMB. If individuals cannot achieve their goals regarding prescribed medication (e.g., inability to pay for prescribed drugs, inability to tolerate medication side effects), they may be less likely to adhere to medication regimens and thus may use various self-management behaviors, such as taking less medication. When individuals can meet their personal goals regarding their chronic disease, medications can be more effectively self-managed. Previous research has shown that goal congruence improves follow-through on chronic disease regimens (Boparai & Korc-Grodzicki, 2011; Ryan, 2009; Ryan, Maierle, Csuka, Thomson, & Szabo 2013). Self-efficacy, the confidence one possesses to be able to act, has been shown to correlate positively with MSMB, and the lack of such confidence can be a barrier to effective self-management behaviors (Health Measures, 2018; Warren-Findlow, Seymour, & Huber, 2012). The current study examined the direct association among caregiver role strain, medical mistrust, the medication regimen, and MSMB and explored whether goal congruence and self-efficacy were mediators among caregiver role strain, medical mistrust, the medication regimen, and MSMB. The relationship of these factors to MSMB has not been adequately explored among African American older women (Hiligsmann et al., 2015; Kendler et al., 2014). The study was correlational and cross-sectional. Recruitment settings included churches, a fitness club, and a nurse-managed health center located in central Milwaukee, Wisconsin. The Institutional Review Board of the university approved the study. Flyer distribution and interaction with staff or pastors and potential participants at each site resulted in successful recruitment. All participants voluntarily agreed to participate and signed an informed consent form. Study data were collected by two study RNs (O.O., V.K.B. ), both African American, with community nursing skills. The data collectors were trained by a social work researcher with expertise on aging, a professional nursing consultant (B.N.) who was familiar with the community, and the principal investigator of the study (J.L.E.). Participants were asked to obtain a list of their current medications from their pharmacy and bring it to the data collection meeting. Each participant met with a study RN in a private room in a mutually agreed-upon community location, such as a library or church, for consent and data collection. Each participant then underwent a 30- to 60-minute, in-person interview with the study RN. Participants responded to the interviewer-administered structured questions and reviewed with the study RN the pharmacy medication lists that they brought to the meeting. The sample comprised 116 African American women. To be eligible for the study, participants had to be African American, female, age ≥50 years, diagnosed with two or more chronic diseases, and taking prescription medication. Exclusion criteria included screening positively for high levels of depressive symptoms (two women screened positive for depression, and the study RNs followed a specific protocol for follow up) or being on hemodialysis. The sample size for caregiver role strain was 87, because 87 of the 116 participants identified as caregivers. GPower 3.1 software was used to conduct a power analysis for multiple regression (Faul, Erdfelder, Buchner, & Lang, 2009). Seven independent variables were defined. Subsequently, a sample of 103 participants was needed to detect a mediumsized effect (f2 = 0.15, where f2= R2/[1 − R2]) at a 0.05 significance level with 80% power. Data were analyzed using SPSS version 24. Participants' ages ranged from 50 to 98 years (mean age = 64.1 years, SD = 9.4 years). Forty-six percent reported an income of less than $12,000 annually, and the majority reported less than $15,000 annually. Participants were generally living alone (44.8%), and 21% were married. Fifty percent had a high school degree or less and 50% had some college education or were college graduates. Participants had an average of four (SD = 1.24) chronic conditions and were taking an average of nine (SD = 4.4) prescription medications. 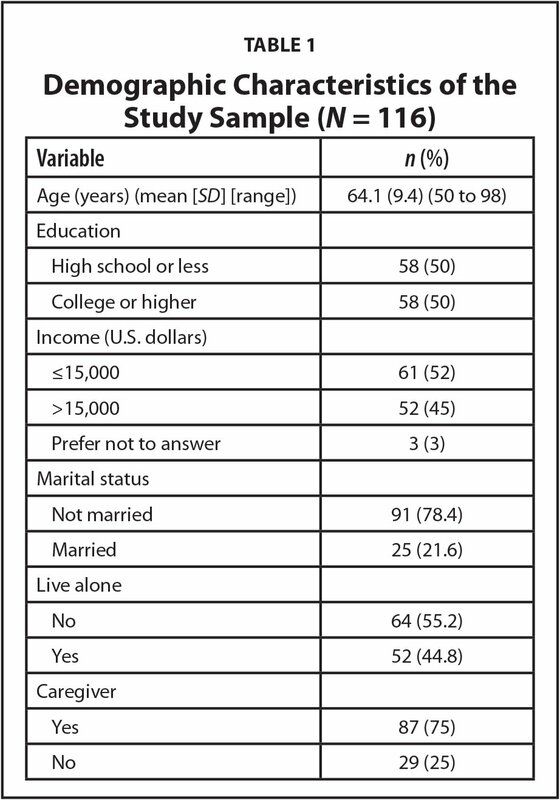 Three quarters (75%) of participants reported that they were caregivers (Table 1). Medical mistrust was measured with the 12-item Group-Based Medical Mistrust Scale (GBMMS) (Thompson et al., 2004). The GBMMS was selected because it focuses on health care provided in the social context of racism and discrimination, and it captures factors including suspicion, discrimination, lack of support, and beliefs related to mistrust based on one's racial group. The score range is 12 to 60 on a 5-point Likert scale; the higher the score, the higher the mistrust. In the current study, the instrument had a Cronbach's alpha of 0.77. The 13-item Modified Caregiver Strain Index was used to measure caregiver role strain (Thornton & Travis, 2003). Based on a 3-point Likert scale, this tool explores aspects of life that may be affected by caregiving, such as an individual's finances. The possible score range is 0 to 39; the higher the score, the higher the strain. In the current study, the scale's reliability had a Cronbach's alpha of 0.87. This scale has been used previously in this population. The anticholinergic burden of participants' medication regimens was assessed for appropriateness and safety using the Anticholinergic Burden Scale (ABS), a list of drugs within three levels of anticholinergic properties (Campbell et al., 2013). Medications prescribed to participants were checked on the ABS and points were tallied for a final score. Participants provided study RNs with a list of their prescription medications obtained from their pharmacies; over-the-counter drugs and supplements were self-reported. Goal congruence was measured using an instrument created by and adapted with the permission of the developers (Ryan et al., 2013). The original tool focused on osteoporosis treatment, but it was modified to focus on individuals' medication regimens. Multiple professionals with appropriate expertise validated the modified instrument. The instrument has 21 questions with a Likert scale from 1 (no problem) to 5 (significant struggle or problem) with a score range of 21 to 105. The prefaces to all questions on the goal congruence instrument were “I would really like to but…”, and “Choose the answer that best describes your desire or ability to….” Topics in the instrument included such issues as “Take my medication without becoming sleepy” and “Figure out what I need to know about new medications.” This tool measured the individual's goals related to her medications and whether she has the desire and ability to meet those goals. The response categories rate “how much of a problem” achieving each goal is; accordingly, high scores indicate more problems and less congruence. Cronbach's alpha was 0.89. The adapted instrument was found to be feasible to administer and participants had no problems understanding how to reply to the tool when tested in a five-participant pilot study. To assess self-efficacy, the PROMIS® Self-Efficacy for Medications and Treatments instrument and the Self-Efficacy for Managing Chronic Disease instrument were used (Health Measures, 2018). The Self-Efficacy for Managing Chronic Disease Scale contains six questions and a Likert response from 1 (not at all confident) to 10 (totally confident). Scores range from 6 to 60; the higher the score, the higher the self-efficacy for managing chronic disease. Cronbach's alpha for this scale was 0.85 (Health Measures, 2018). The Self-Efficacy for Medications and Treatments measure comprises five questions rated on a 5-point Likert scale from 1 (I am not at all confident) to 5 (I am very confident). The possible score range is 5 to 25; the higher the score, the more confident the participant reported managing her medications. In the current study, Cronbach's alpha for the Self-Efficacy for Medications and Treatments instrument was 0.89. MSMB were measured by the Morisky Medication Adherence Scale (MMAS) (Morisky, Ang, Krousel-Wood, & Ward, 2008; Morisky, Green, & Levine, 1986). Scores were calculated using the instructions provided by the instrument's authors. On the MMAS, possible scores can range from 0.25 to 8, with 8 indicating high medication adherence (Morisky et al., 2008; Morisky et al., 1986). Although the MMAS is a self-report adherence scale, this tool also includes aspects of medication self-management that are consistent with the conceptualization of MSMB in the current study, such as decision-making behavior regarding whether to take a medication and whether the individual ever feels hassled to stick to her treatment plan. These behaviors go beyond adhering to what is prescribed, including beliefs and actions about prescribed medication. Data were evaluated for missingness and inspected for variability and correlations to identify the best predictors. An ordinary least squares (OLS) regression model was used to study the relationship between the predictor variables and MSMB. Predictor variables with a relationship with MMAS score in the bivariate analyses were eligible for inclusion in the OLS regression model. 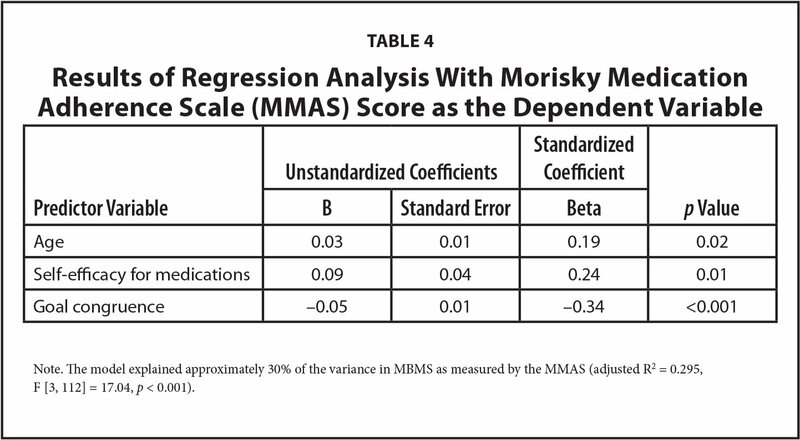 The mean MMAS score was 5.46 (SD =1.70); a score of 5 is considered low MSMB (Table 2) (Morisky et al., 1986, Morisky et al., 2008). There were no statistically significant relationships between the demographic variables of education, income, marital status, living alone, caregiving, and MSMB. Medical mistrust, caregiver role strain, and anti-cholinergic burden also were not significantly correlated with MMAS score (Table 3). Seventy-five percent of participants reported being caregivers to adults or children, and 19% of those participants said they were primary caregivers, providing weekly direct care for spouses, parents, children, grandchildren, or others. Surprisingly, 81% of individuals who identified as family caregivers reported low or no caregiver role strain (mean = 6.1, SD = 4.9). Only those participants who provide 35+ hours of primary caregiving weekly experienced high role strain, but there was no statistically significant correlation between role strain and MSMB (r = −0.12). Only 3% of participants who were caregivers reported that the care recipient was a parent; most said that they cared for spouses, children, grandchildren, and others. Although participant mean age was 64, this sample did not reflect much older adult care. Being a caregiver or hours of caregiving did not correlate with MSMB. 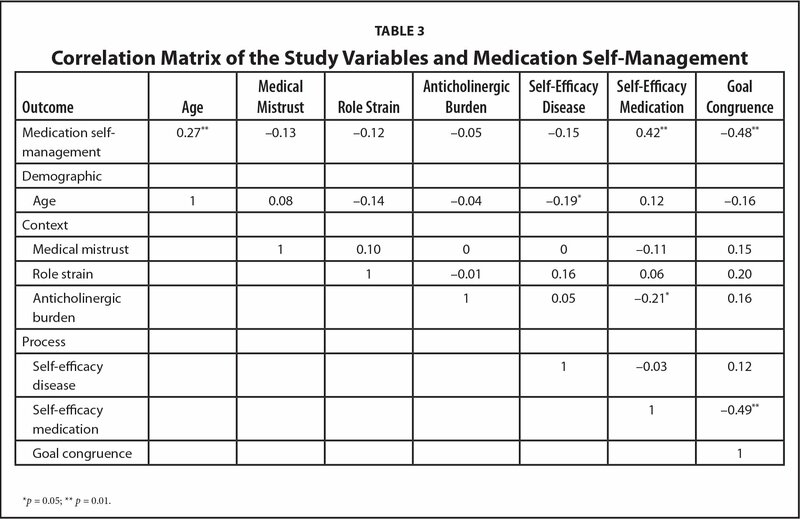 MMAS score correlated significantly with age, goal congruence, and self-efficacy for medications (Table 3); as a result, these variables were included as predictors in the OLS. Participants had higher self-efficacy for medications than for chronic disease, and the two scales did not correlate significantly. The proposed mediators of goal congruence and self-efficacy for medication and the outcome variable MMAS were not associated; thus, it was not possible to perform a mediation analysis. When tested together in the regression model for the three predictor variables, age, goal congruence, and self-efficacy for medication were significant predictors of MMAS score. Results of the OLS regression model are presented in Table 4. The standardized coefficient betas can be used to explain the relative importance of the predictors of MMAS score. The beta values showed that goal congruence is the most important predictor of MMAS score. The relationship is negative because a lower goal congruence score means no problems or high goal congruence and is related to higher MMAS scores (Table 4). Self-efficacy for medication is the second most important predictor of MMAS score, and age is the third. Both self-efficacy for medications and age have positive relationships. The model explained approximately 30% of the variance in MSMB as measured by the MMAS (adjusted R2 = 0.295, F [3, 112] = 17.04, p < 0.001). Managing medication is an essential component of chronic disease self-management. Overall, women in this study had low levels of MSMB. The factors found to relate to MSMB were age, goal congruence, and self-efficacy. The older the women, the higher the MSMB. Although the age range of participants was 50 to 98 years, many women in the sample were in their 60s. This finding suggests there should be a particular focus on self-management support for African American women between ages 50 and 69 years. The current study adds to the literature by demonstrating that in African American older women goal congruence and self-efficacy for medications account for 30% of the variance in MSMB. This finding suggests that these process variables should be a core component of intervention research in self-management support for this population. It is essential to inquire about the goals that women have regarding their medication regimen and to provide ways to bolster goal congruence related to medication. An example regarding antihypertensive medication can be used to further explain goal congruence. The common goal of individuals who take antihypertensive medication is to lower blood pressure to a normal range. There are many types of antihypertensive drugs each having different costs, mechanisms of action, dosing, and side effects and these medication characteristics need to match an individual's goals for optimal MSMB. For example, if a woman needs to get grandchildren ready and transported to school in the morning, she may not be able to tolerate the excess urination that diuretics cause. An action to support her would be to provide more knowledge about her medication and provide an intervention to empower her to communicate with her provider and share how her medication regimen is not congruent with her goals. Limitations of the current study include the use of a convenience sample that may be biased and less generalizable than a random sample. Self-report bias can also affect results, as participants may remember or report higher levels of self-management behavior. The list of medications from participants' pharmacies provided information on only prescription medication; information about over-the-counter drugs and supplements was obtained through self-report, which is less reliable than a pharmacy report. In addition, participants could have taken prescription drugs obtained from non-pharmacy sources that would not appear on the list. Collecting accurate data was enhanced by the study RNs, who were skilled in community care nursing and working with African American older women. The study RNs brought their skills to the role, and they received training regarding strategies to enhance support with participants. The sample was limited to the central-city area of a large Midwestern metropolis and may not be generalizable to other geographic regions. A correlational design does not allow for causal claims. The MMAS measures more than adherence but still represents a narrow range of MSMB. The MMAS also had a low Cronbach's alpha, most likely due to the construction of the measure with mostly binary responses. Although almost all the instruments used have been tested previously with African American populations, there was an exception in the newly modified goal congruence scale, which was used for the first time in this study. The goal congruence tool has other limitations as well. Because participants were not asked to identify goals but instead were provided with a list of commonly known medication-related goals, it is not possible, in those with very low scores, to differentiate between having no problem meeting a goal or having no goal in that area. Further refinement of the goal congruence measure is needed. Measurement error and response-set biases are always possible with survey research (Polit & Beck, 2016a,b). The fact that medical mistrust was present in this sample but was not related to MSMB may be due to the tool used, which was an instrument that measures, in part, the perception of discrimination in health care based on race. The effect of high caregiving responsibilities on MSMB also needs further study. Use of caregiver role strain rather than caregiver burden was an attempt to address the positive role of caregiving in the Black community. Role strain does not imply that caregiving is a negative endeavor or a burden but instead asks how caregiving affects aspects of a caregiver's life by adding a new role to existing roles. A recommended next step is to study the effect of high caregiving responsibilities within other frameworks. One perspective might be the Strong Black Woman phenomenon (Woods-Giscombe, 2010) to examine whether socialized Black woman identity is a factor in why high caregiving responsibilities did not correlate with high reported strain. The purpose of the current study was to examine MSMB in African American older women who have chronic disease and examine the factors specific to that population. Age, goal congruence, and self-efficacy for medication explained 30% of scores on a measure of MSMB. This finding lends support to developing interventions that incorporate those factors. Goal congruence concerning MSMB in African American women with high rates of chronic diseases and many prescription medications had not been studied previously. The current findings suggest that goal congruence and self-efficacy for medication are two critical factors to consider when providing medication self-management support. Caregiver role strain scores were lower than expected, given the high levels of caregiving in the context of low income and high chronic disease burden. The relationship of family caregiving responsibilities and role strain to medication self-management needs further study using other models. The findings of this study reveal factors that are essential to the development of individualized, cultural, and socioeconomically appropriate interventions to support medication self-management for African American women who experience severe health disparities in chronic disease outcomes. Campbell, N.L., Maidment, I., Fox, C., Khan, B. & Boustani, M. (2013). The 2012 update to the anticholinergic cognitive burden scale. Journal of the American Geriatrics Society, 61(Suppl. 1), S142–S143. Institute of Medicine. (2012). How far have we come in reducing health disparities? Progress since 2000: Workshop summary. Washington, DC: National Academies Press. Polit, D.F. & Beck, C.T. (2016a). Data collection in quantitative research. In Resource manual for nursing research generation and assessing evidence for nursing practice (10th ed.) (pp. 282–283). Philadelphia, PA: Wolters Kluwer. Polit, D.F. & Beck, C.T. (2016b). Measurement and data quality. In Resource manual for nursing research generation and assessing evidence for nursing practice (10th ed.) (pp. 298–299). Philadelphia, PA: Wolters Kluwer. Trachtenberg, F., Dugan, E. & Hall, M.A. (2005). How patients' trust relates to their involvement in medical care. Journal of Family Practice, 54, 344–352. Dr. Ellis is Assistant Professor, Dr. Kovach is Distinguished Professor Emeritus, Dr. Ke is Associate Researcher and Statistician, College of Nursing, University of Wisconsin–Milwaukee; Ms. Baldwin is Nurse Clinician, Educator, and Case Manager, House of Peace Community Nursing Center, Milwaukee; Dr. Olukotun is Staff Nurse, Acension Health Columbia St. Mary's, Milwaukee; Ms. Nichols is Former President, American Nurses Association, and Former Chief Executive Officer, Commission on Graduates of Foreign Nursing Schools International, Madison, Wisconsin; and Dr. Fendrich is Professor and Associate Dean for Research, University of Connecticut School of Social Work, Hartford, Connecticut. Dr. Kovach is also Director of Research, Ovation Communities, Milwaukee, Wisconsin. The authors have disclosed no potential conflicts of interest, financial or otherwise. Research reported in this publication is funded by the National Institute of Nursing Research of the National Institutes of Health (NIH) under award number P20NR015339. Additional support was provided by the University of Wisconsin-Milwaukee (UWM) Office of Research and the UWM College of Nursing. The content is solely the responsibility of the authors and does not necessarily represent the official views of the NIH. Dr. Kovach was not involved in the peer review or decision-making process for this manuscript. Address correspondence to Julie L. Ellis, PhD, RN, GCNS-BC, Assistant Professor, College of Nursing, University of Wisconsin–Milwaukee, 1921 E. Hartford Avenue, Milwaukee, WI 53211; e-mail: jellis@uwm.edu.